Carrie Floyd told me that at the baseball game last night, she saw a sign that made her look twice. "Does that sign say 'oats'?!" she asked her daughter. "It says outs!" replied her daughter, with all the exasperation a sweet 12-year-old can muster. "Jeez, Mom." So Carrie's eating in a lot (which I admire, always) and cooking a bunch. Not only that, but she's put together [/articles/features/grain_glossary "a mighty useful glossary" newpage=false] of 20 of her new best friends: whole grains, from amaranth to wheat berries. It's a great resource, and if you haven't seen it yet, check it out before your next grain quest. Maybe you'll find something there to inspire you. 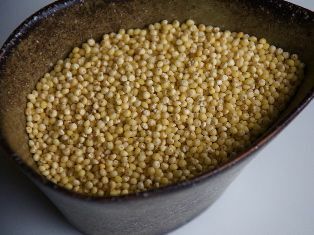 Personally, I'm on the hunt for red or black quinoa; I want to try this recipe from a singer I admire greatly, Pink Martini's China Forbes.